82 percent of marketers stated that generating brand awareness was their top goal in 2015 (Content Marketing Institute & MarketingProfs). However, when it comes to organic search, many marketers do not view this channel as an opportunity to invest in their brand. Instead it’s seen a medium to gain quick wins. Too often, SEO is considered something a company needs to do in order to keep up with the rapidly changing digital landscape. 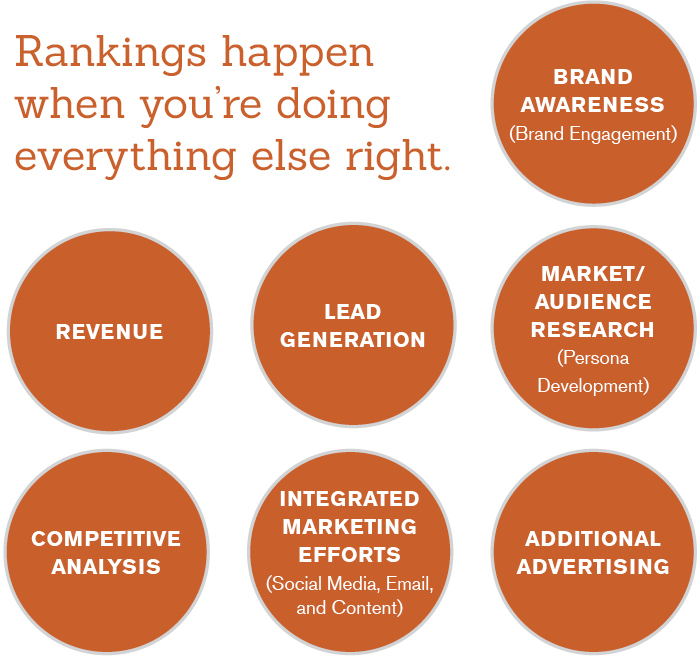 We have heard time and time again, “We need to do SEO because [insert competitor name] is doing it.” When approaching SEO from this viewpoint, marketers tend to just focus all of their efforts on ranking. This isn’t a forbidden goal to have, but it certainly isn’t the most effective way to invest in your brand. Marketing Directors need to strategically set goals to measure engagement in ALL parts of the funnel to ultimately achieve successful results from search. “Search engine rank is the metric focused on more widely than any other, and yet in only rare cases is it the metric that matters most.” Josh Steimle, Forbes. What allows a company to successfully achieve these “education” and “buy” goals? A strategy. Long gone are the days when organic search is an easily penetrated market; to achieve strong results, marketers first need to establish a commitment to investing in their brand and developing realistic and measurable goals. “Search” does not just mean the words typed into a search engine. A search can be defined as the journey users take to solve a problem or satisfy a need. Today, 93% of online experiences begin with a search engine (CMO). Users partake in longer search journeys than ever, which may include phases such as awareness, interest, intent to purchase and post-purchase. For example, here are the types of queries a user might search when looking for kitchen remodeling products. These phases may differ in type and length based on vertical, so they require different goals and strategies. Cookie cutter SEO strategies do not exist. Therefore, companies should invest in SEO to understand the way users search during their entire search journey – not just to rank for keywords in the intent to purchase or equivalent phase. “Over time, Google will care more about identity and social reputation.” – Matt Cutts, Google Search Team Software Engineer. We know that brand engagement, perception and awareness work. If we’re ensuring that people know about our brand, we’re contributing to building the business. In terms of SEO, brand awareness can also influence rankings, traffic and conversions – both positively and negatively. However, let’s take this one step further. Companies not only need people to “know about” their brand, but also need people to be meaningfully engaging with their brand. This often happens through content. For example, The Knot is an extremely successful wedding planning and ideas website that creates unique, useful content. It competes with top wedding companies and publishers in terms of audience and SERP landscape. Here’s an additional way of looking at brand engagement: companies don’t need the world to love them. They just need to invest in the audience that’s going to identify with their brand. They need those people to love them. This means going above and beyond to serve them. Whatever your audience needs of you to serve them or engage with them, should become your goal. Let’s check back to that rankings goal again. *shudders* Even if you can convince Google that you deserve the #1 spot, if you’re not going above and beyond to understand your audience & identify with them, you’re still not gonna get sales. You’re still not growing the business or investing in brand. Sorry, not sorry. With advanced analytics services, we can clearly measure this goal! For example, analytics can track if users are taking actions on your website, such as downloading white papers, sharing lookbooks, or clicking from a blog post to a product page. Analytics can also dig deeper than ever before into tangential interests, personalities, demographics, and the things that jive with users. Ultimately, analytics can help marketers answer this question: what is it about my brand that users relate to? So how do we identify the individuals who jive with our brand and fit within our target market? Audience persona development. No, not the traditional persona such as “This is Nancy. She’s 45 years old, lives in Texas and has a yearly income of $80,000.” We mean identifying personas by the way they search. This isn’t about alienating people; it’s about engaging with people that have the same need. In other words, classifying people based on their needs, instead of their demographics. For example, one consumer could be a 45 year old mom from the South and another is a 25 year old mom from NYC. If they’re both searching for the “best granola bar for a two year old,” they could both be considered your target market. Advanced search audience personas would inform you that both moms need information on granola bars for their two year olds. Traditional persona development might blow off that mom from the South (or vice versa). How can advanced search audience personas benefit a brand? Because personas are the foundation of a great user experience! Google’s algorithm sees user experience as a priority, but more importantly, without a clear understanding of who your audience is – your business is much more likely to fail, not just in the SERPs, but in the industry market as a whole. The intent behind the query may not match up to what the user wants. Your brand may not be the one users want to see. Users click through to your site, but they don’t convert. I’ll explore why these three situations are crucial to consider when forming your search strategy. 1) The intent behind the query may not match up to what the user wants. 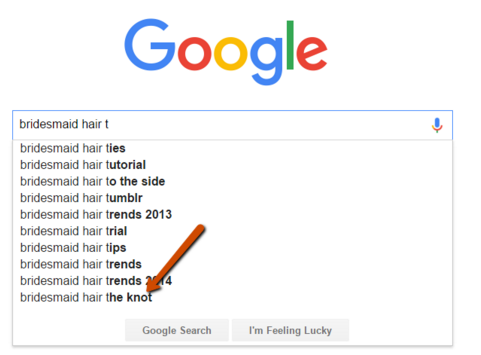 Users today are searching using specific, long-tail keywords when they are looking to make a purchase. Large head terms with hundreds of searches per month, are valuable – but for educational goals, not so much for purchase goals. So if your company is only ranking for educational queries – they will have a hard time driving revenue without a robust lead nurturing strategy. The same goes for just targeting long-tail keywords – if your brand doesn’t have any educational content – a user will be less likely to trust your brand or make a purchase. 2) Your brand may not be the one users want to see. Today, users drive search engine results. Even if your result is ranking number one – a user may see their favorite brand ranking number four and click on that result instead. If you focus on building content that answers users’ questions and provides real value, it will ensure that they want to view your content over any other brands’. 3) Users click through to your site, but they don’t convert. If you are investing all of your money in achieving rankings, yet don’t have a conversion strategy for when they actually land on your content – you won’t receive any revenue or revenue-driving conversions. 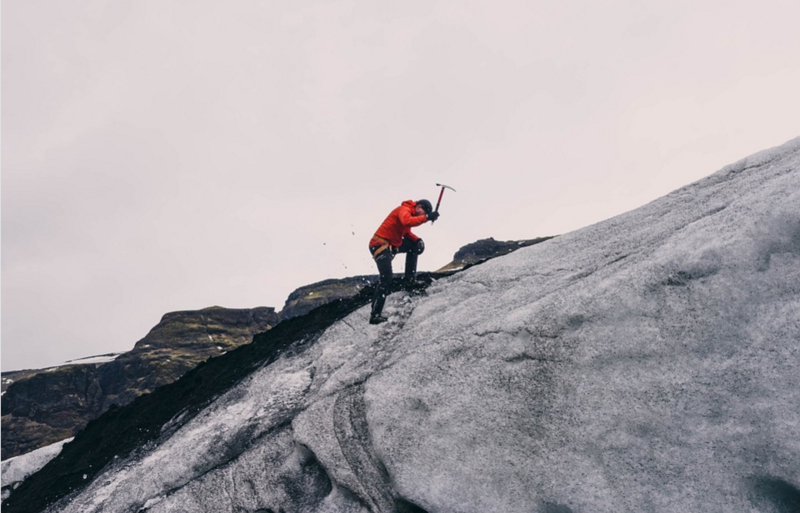 If users are not engaged throughout the search journey, from first sight in the SERPs to on-page conversions in the long term, your brand isn’t going to rank well on Google, you won’t increase sales, and most importantly, you won’t grow your business. When approaching search, understand your audience’s entire search journey and build a strategy to truly support them. Then, set goals accordingly based on your unique business needs. Shout out to Seer’s Ali Freezman, who helped me identify strategic areas of focus that are crucial to building a solid SEO strategy. Got questions or thoughts? Hit us up on Twitter: @alexis_wolfer and @AFreezee or contact Biz Dev.